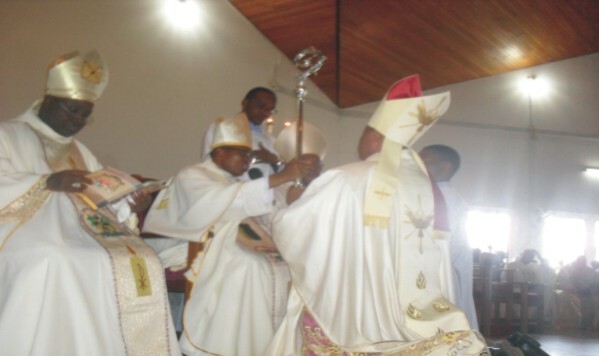 As the Roman Catholic Mothers world over set to celebrate this year's Mothering Sunday on Sunday 19 April 2015, the Catholic Bishop of Awka Diocese, His Lordship Most Rev. Paulinus Ezeokafor has admonished the mothers to spend more time with their children in order to ensure proper up-bringing as well as help in reducing vices in society . Bishop Ezeokafor who gave the admonition during a news briefing at St. Patrick's Catholic Cathedral, Awka the Anambra State capital, stated that the role of mothers in family building can not be over-emphasized as they performed the bulk of domestic chores including the task of raising the children . On the heels of the impressive showing of the All Progressives Grand Alliance (APGA) led by her husband the BoT Chairman and Governor of Anambra state, Chief Willie Obiano in the just concluded general elections, and as she gets set to distribute the second phase of prosthetic limbs to about 200 physically challenged beneficiaries on Tuesday April 2015, Chief (Mrs.) Ebelechukwu Obiano has come under another malicious attack aimed at damaging her credibility. Report has it that strange information is coming out from Ire-Inwelle Ogidi community, Idemili North Local Government Area, Anambra state. 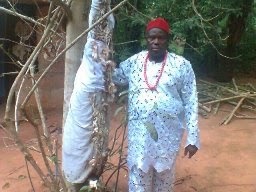 The chief priest of all the shrines and oracles in Inwelle Ogidi community, Chief Felix Obika hinted that Governor Obiano is a traditionalist who respects the ancestors and believes in the efficacy of the spirits, oracles and deities which earned him victory for All Progressive Grand Alliance, in the state House of Assembly. He said the spirit world did it for Governor Obiano as a way to enable him relax and continue in his infrastructural development of the state. Obika said: “On assumption of office the Governor vowed to sack kidnappers and armed robbers who have been terrorizing the state and he had the support of the gods that helped him to clear them. Akwashiki made the announcement after Wednesday’s Federal Executive Council meeting. A grand conspiracy to abort the ongoing transformation of Anambra State’s economy and society under the Willie Obiano administration crashed on Saturday, April 11, 2015 with the crushing defeat of the PDP in the State Assembly election. The infamous plot hatched by few Abuja – based politicians would have seen the removal of Governor Willie Obiano and his deputy, Dr Nkem Okeke before September this year to pave way for the installation of a pliant Governor who would carry out the biddings of these power speculators. Long known as one of the world’s most exclusive ultra-luxury resorts, the iconic One&Only Palmilla resort will re-open on 20 April 2015 and will introduce the most comprehensive integrated spa, beauty, men’s grooming and fitness centre in the Baja region. The new centre includes the brand new beauty salon, OBO by Jonathan & George, as well as Barber & Blade, the new men’s grooming and shave studio, plus a completely new state-of-the-art Technogym fitness centre with a range of personal training, fitness and wellness programmes. One&Only Spa also re-opens with an all-new menu, expanded retail experience and fresh juice bar. The complete renovation of spaces and additional offerings provide what today’s guests are seeking in an ultra-luxury resort and underscores One&Only’sdedication to wellness which is a key focus of the brand and particularly of One&Only Palmilla. The just concluded 2015 general election which comprised of the presidential and national assembly. Below is a list of the winners from the senatorial election and their states. From the list elected Senators, Only eight of the 109-member Chamber of the National Assembly are women. The All Progressives Congress (APC) and the Peoples Democratic Party (PDP) will constitute the next Senate with 60 of the Senators have been elected on the APC platform and the PDP has 49 elected on its platform. association was formed through the instrumentality of some eggheads in the town who saw the need to come together for the development of the area. a decade of existence, but also 10 years of remarkable achievements. their staying together, joining forces to lift the community high and the various achievements recorded within the period. carried out activities that attracted their interest. APGA Winner of Anambra East/ West federal constituency, Chief Peter Obiano Madubueze, Okaka Anam, has said he owed his March 28 national assembly election victory in the State to the executive governor of Anambra State, Chief Willie Obiano. Chief Madubueze who stated this in Awka during a media chat said he would forever remain grateful to Obiano for believing in his undoubted capabilities noting that his victory at the poll was not in any way a mean feat. He also thanked the people of Anambra East/West for their support assuring them that he would do everything humanly possible to repay them even as he vowed never to betray the trust and confidence reposed in him. When asked what kind of legislative influence he intend to bring to bare for his people, he said, 'I know about Federal Character Commission I know how to get my people jobs. I will ensure that all the ecology funds are used for their purpose. Apart, from that we need roads in our areas because we are the food basket of the state. Most of the crops produced are sold at cheap prices simply because there are no roads to convey them to urban areas. I now that I have clinched the national assembly ticket, I will affect the lives of the farmers in my area,' he pledged. Worried by the incessant crisis rocking the Nigerian movie industry coupled with the menace of piracy, producer of the popular TV series, “Papa Ajasco” and CEO of Wale Adenuga Productions, Wale Adenuga(MFR) has added his voice on the need for the practitioners to shun anything that will undermine the development of the industry. He also canvasses for the establishment of an umbrella body that will represent the interest of all film makers in the country. Adenuga made this observation , earlier in the week while addressing the press. He insists that establishing a national body is the only way the industry can move forward in this new dispensation. Gale of defections hitting the outgoing ruling Peoples Democratic Party, PDP assumed a serious dimension yesterday with its former National Chairman, Prince Vincent Ogbulafor visiting the national secretariat of the All Progressives Congress, APC in Abuja. Ogbulafor who arrived the secretariat at about 2:35pm went into a closed door meeting with the APC national chairman, Chief John Oyegun. The meeting lasted for about 40 minutes. It will be recalled that as sitting PDP national chairman, Ogbulafor scored a first when he boasted in 2008 that PDP would rule Nigeria for 60 years. The phrase later became maxim for the party members even in the last presidential election campaign. But it was not too long when things fell apart between the Abia State born politician and President Goodluck Jonathan consequent upon a statement credited to him before 2011 general elections that power must remain in the north before 2015. Zulu King Godwill Zwelithi's utterances on March 23rd launched the Zenophobic attacks in South Africa and he had refused to apologize, even after finding out that his people have maimed, killed and destroyed businesses belonging to black foreigners. He's still insisting that foreigners should go back to their countries but tried to save face by saying attacking the foreigners is not how to chase them away. He wants the government to do it legally. During a speech last month, Zwelithini called for the deportation of foreign nationals living in the country, saying it was unacceptable locals were being made to compete with people from other countries for the few economic opportunities they had available. King Zwelithi said "foreigners must pack their bags and go home". His three major complaints and why he wanted foreigners to go were; 1. SA traders in the townships said they could not compete with the prices that foreign-owned businesses were selling their products. 2; foreigners involved in crime. 3. Lack of respect shown by foreigners to locals. “Most government leaders do not want to speak out on this matter because they are scared of losing votes. As the king of the Zulu nation, I cannot tolerate a situation where we are being led by leaders with no views whatsoever. Hardly will anyone argue that the contemporary Nigerian society is not such that is riddled with avarice and corruption. Both the public and private sectors of the economy stink with stench of clandestine criminal activities. From the office of Local Government Councillor to the exalted office of nation’s President, looting of public treasury stands tall. The evidence: Palatial houses, private jets, exotic cars, countless Chieftaincy titles, flamboyant foreign trips, properties at home and abroad, the list goes endlessly. In fact, it could be a taboo to occupy and exit office without embezzling public funds. But in the midst of all these, there is a Nigerian whose integrity resonates even with tearful testimonials. He is General Mohammadu Buhari. From east to west, north to south, he stands assuredly different from among folks. He has occupied many exalted offices within the political hemisphere of Nigeria, yet available records show he did not selfishly enrich himself. Perhaps, the piece below intrinsically laced up with pictures of the country-side bungalow of Buhari in Daura, Katsina State tells the story more. Did Oba Akiolu’s threat work for Ambode? Yes and No! 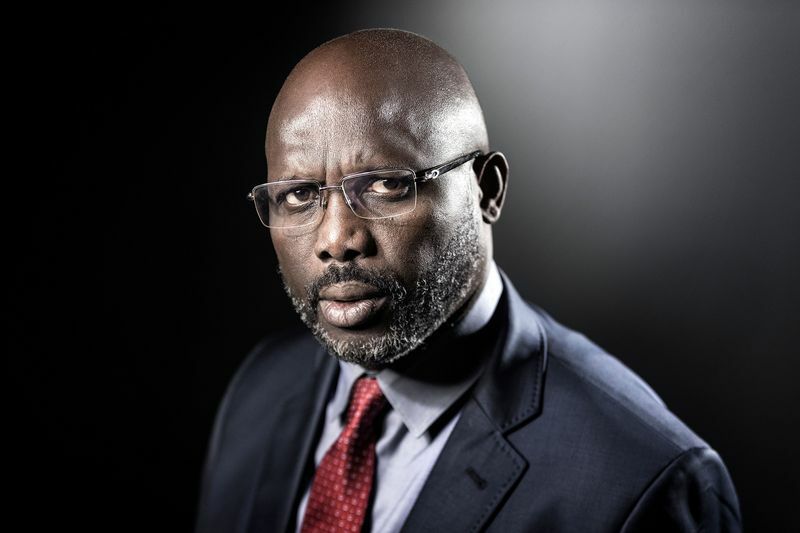 Pa Ikechukwu Okonkwo, a septuagenarian, and his family stayed back in their three-bedroom apartment in Festac Town, Amuwo Odofin, Lagos, to monitor reports from his large screen television while the April 11 gubernatorial election lasted. Unlike the previous election, where the aged grandpa had encouraged all his children to vote for President Goodluck Jonathan in the March 28 presidential election, this time, he handed down a warning to all members of the family never to be involved in the gubernatorial election in the state. His reason was not farfetched. 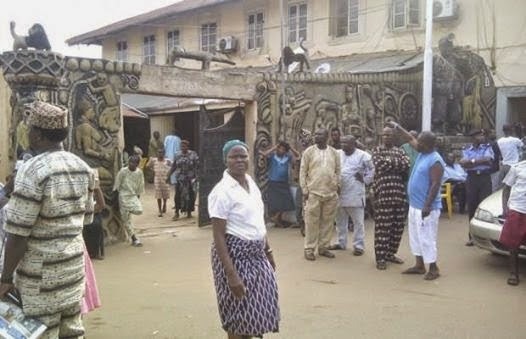 The joy of the couple whose three children were abducted by a maid in Lagos knew no bounds, Wednesday, after they found their children, hale and hearty, dumped in a building at Shasha, a suburb of the city. Before their eventual discovery, the couple had reportedly traversed round Lagos and other adjourning areas in company of operatives from the Special Investigations Bureau, SIB, attached to Lagos State Police command headquarters in Ikeja. Earlier, we heard about a strange illness in a community in Ondo state that has killed at least people who woke up blind, with headache, rashes on their bodies and died 24 hours later. According to new reports, it's not a medical condition. The state commissioner for Information and Strategy said the illness and sudden death is connected to an exhumed corpse in the community. He said people who've died so far were those who had contact with the people who exhumed the corpse. 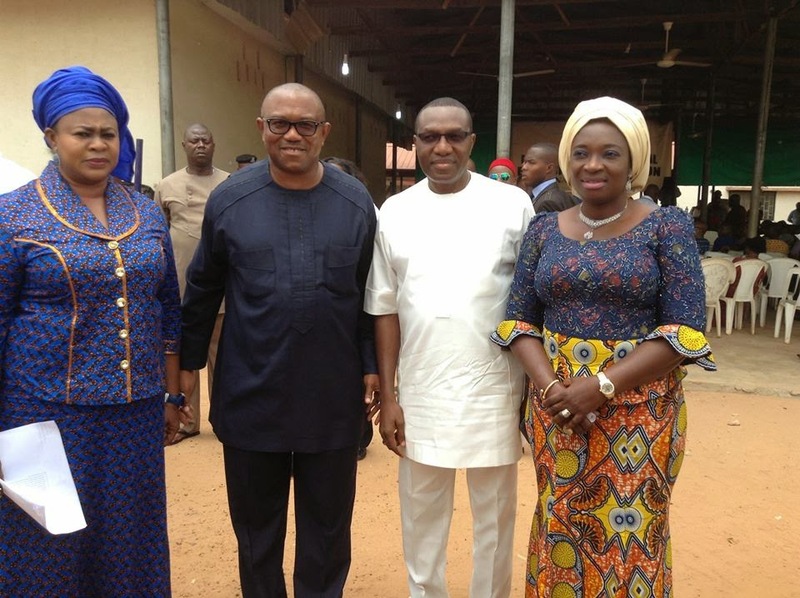 The former Governor of Anambra State, Mr. Peter Obi has assured that the PDP members in the National Assembly will work with APGA for the ultimate good and progress of the State. He said this today during the presentation of Certificates of Return to those that won the Senatorial and House of Representatives seats in the State. Incoming Muhammadu Buhari administration will replace the top management of the Nigerian National Petroleum Corporation (NNPC), Reuters news agency reported yesterday. It will also review the accounts of the oil company to restore credibility, Reuters said, quoting sources within Buhari’s party, the All Progressives Congress (APC). It said the new government will submit a bill to break the NNPC into four entities, as already prescribed in the latest PIB draft. Others said more generally that the minister’s current powers would be heavily trimmed. Oil and gas will have separate companies for upstream, with a third covering pipelines and refining, while a fourth will be an inspectorate. 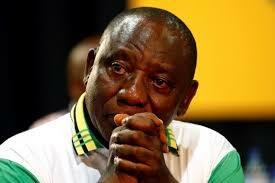 The proposal could be submitted to parliament in the first quarter of next year, one parliamentary APC source said. Former Senate Chief Whip, Rowland Owie, has advised president-elect, Muhammadu Buhari to be wary of former President Olusegun Obasanjo if he desired to succeed as Nigeria’s leader. In a statement in Benin City, capital of Edo State, yesterday, Owie said: “To Buhari, I thank God for you, but you must deliver on your promises and also build on what president Jonathan did. “Above all, you must run far from OBJ! (Olusegun Obasanjo). If he can’t control your government, he will fight you. “He has done it to all former presidents of Nigeria and even against MKO Abiola who was not sworn in. “Half way into the tenure of President Goodluck Jonathan, a man who sees nothing good in anybody, except himself, Obasanjo, started trouble making by naming presidential and vice-presidential candidates. The Lawanson Road, Itire abode of the Orekoyas, whose three children were kidnapped by a housemaid last Wednesday, 24 hours after she was employed, became a Mecca of sorts yesterday, following news of their discovery. The children, Demola, 6; Adedamola, 4, and Aderomola, 11 months, were reportedly found in an uncompleted building in Shasha area of Akowonjo, Lagos, Tuesday night, after an undisclosed ransom was paid into an account. According to their maternal grandfather, Senior Apostle Abraham Adekunle, the children were found naked inside a bag. No arrest has, however, been made. The abductors, as gathered, had sent an account number of an undisclosed bank to the Orekoyas. The children, who had been ravaged by mosquitoes, were immediately taken to police hospital, Ikeja. When Vanguard visited the Orekoya’s home yesterday, the children and their parents were yet to arrive from the hospital. Their grandfather, Senior Apostle Adekunle, described the eight days of his grandchildren’s disappearance as one of the worst challenges he had faced in his 67 years of existence. Former Governor of Ekiti State, Dr kayode Fayemi, has described as false, reports linking him to discussing the economic programmes of President-elect, Gen. Muhammadu Buhari at the Lagos Business School. In a statement yesterday by his Chief Press Secretary, Yinka Oyebode, Fayemi described such reports as misguided and fabricated. The statement said: “While it is true that Dr Fayemi was Guest Speaker at the Lagos Business School (LBS) Breakfast meeting, he was not there as a representative of the President-elect, General Muhammad Buhari and neither was he introduced as such. Former President Olusegun Obasanjo has urged the President-elect Muhammadu Buhari to realize that Nigerians are expecting a lot from him when he eventually takes over power May 29. Mr. Obasanjo is currently in Sudan as an AU observer in the country’s presidential election. PREMIUM TIMES spoke to him, Wednesday, on Mr. Buhari’s victory. Mr. Obasanjo said he was not ready to “say too much” about the election but noted that Nigerians have passed a message to the retired general by asking for change. “Nigerians have done what needed to be done,” he said. He also called “what has happened” Phase 1. He said Phase 2 would be how the new government establishes itself. SENATOR-ELECT and a chieftain of the Peoples Democratic Party in Ogun State, Chief Buruji Kashamu, has described the National Leader of the All Progressives Congress, Bola Tinubu, as his role model. Kashamu, who is the chairman of the Organisation and Mobilisation Committee of the PDP in the South-West, paid a rare tribute to the former Lagos State governor in an open letter, describing Tinubu as a true hero to be emulated by every Nigerian. Kashamu is the senator-elect of Ogun-East senatorial district and one of the most vocal opponents of the APC before the party won the presidential election of March 28. He said that it was important to honour those deserving of honour now that elections are over. In the open letter addressed to Tinubu, Kashamu said, “Truth be told, men like you are made up of sterner stuff and are rare to come by in every generation. Little wonder you are called the Asiwaju and Jagaban of Borgu. I doff my hat. President Goodluck Jonathan’s decision to formally handover to President-elect Muhammadu Buhari on May 28 will create a power vacuum for a few hours between the period he hands over and the morning of May 29 when his successor will be formally sworn-in as the president. She added that he had directed all ministries, departments and agencies (MDAs) of the federal government to submit their handover briefs to the Office of the Secretary to the Government of the Federation (SGF) on or before April 20. The attacks on immigrant-owned shops and homes in Durban’s impoverished townships come three months after a similar spate of attacks on foreign-owned shops in Soweto, near Johannesburg. Xenophobic attacks continued in the South African port city of Durban Tuesday as the Ethiopian community prepared to repatriate the bodies of three of its nationals killed over the last two weeks. Last month, Zulu King Goodwill Zwelithini, traditional leader of the biggest ethnic group in KwaZulu-Natal province, reportedly said they needed to “pack their bags and leave”. It was a call supported by Edward Zuma, who told local news agency News24 that South Africa was “sitting on a ticking time bomb of them (foreigners) taking over the country”. Ephraim Meskele, a leader of the Ethiopian community in Durban, said it was holding a prayer service Tuesday for the three victims, including a man killed when his shop was petrol-bombed on Friday. About 50 people have been arrested over the violence, in which at least four people have been killed. The police have not confirmed the nationalities of the victims. 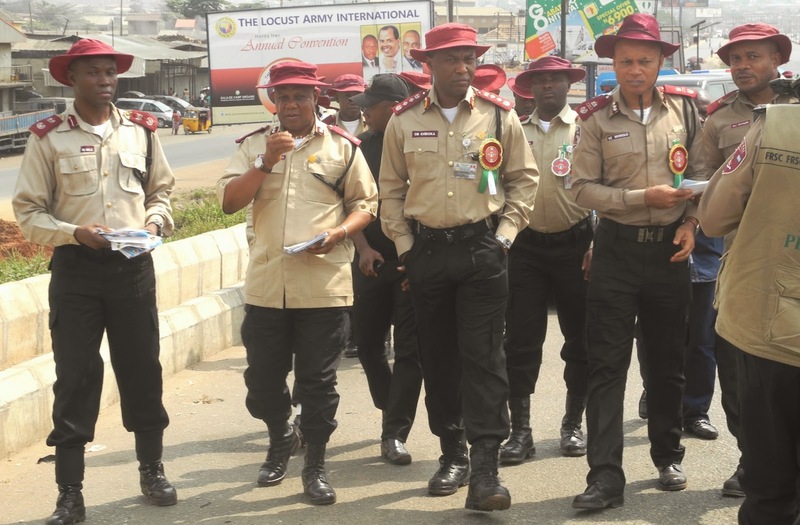 As part of the drive towards reduction of carnage as wellas inculcate the culture of safe-driving on the high ways , the Federal Road Safety Commission has taken a step further to introduce road safety tips in hotels in Anambra State . Sector commander of the commission in the state Mr. Sunday Ajayi disclosed this to Fides at the command headquarters Awka during an exclusive chat . Mr.Ajayi said that it became necessary to take roadsafety tips to the hospitality industry because holiday seekers and travellers alike find temporary abode in hotels . He further explained that most of the people who patronized hotels were motorists and roadusers and as such it became pertinent that roadsafety messages were pasted in the rooms at vantage point where guests can relax and read them with avid attentiveness. The sector commander also disclosed that Anambra State is the first state in Nigeria where such innovation was introduced adding that the import of the innovation was as a result of human factor . He said human beings ply the highways and that it was incumbent on the commission to get them acquainted with roadsafety tips using hotel rooms as a means of spreading roadsafety messages to the motoring public . Chief Executive Officer of Capital Oil and forerunner of Transformation Ambassadors of Nigeria ( TAN ) Chief Ifeanyi Ubah has categorically stated that there was absolutely no need to impeach Governor Willie Obiano of Anambra State . This categorical statement made by the oil magnet came on the heels of allegations in some quarters that the Peoples Democratic Party was doing everything humanly possible to secure majority seats in the State House of Assembly to provide a leaway for the PDP majority to unseat Governor Obiano . Chief Ubah who had a chat with Fides at his country home, Nnewi, said there was no such clandestine move to truncate the affairs of the present administration in the state and that the party had little or no interest in the state assembly elections . The winner of March 28 Anambra east, west federal constituencies national assembly election, Chief Peter Obiano Madubueze (Okaka Anam) said the reason he was not rigged out was because of the vigilance of his supporters who kept vigil to guard their votes and insisted that the votes must count. The lawyer who stated this in an exclusive interview with Fides in Awka noted that he was highly elated and full of praise for his teeming supporters noting that he owed his victory to Gov. Willie Obiano. 'I owe my victory to Governor Obiano. God made it possible through him. The card reader failed completely and perhaps that helped the PDP to rig everywhere except my constituency, Anambra East and West Federal Constituency. They could not also rig Oyi/Ayamelum federal constituency election. And we do hope that those APGA candidates rigged out will still get their mandates,' Mr Madubueze assured. Much may not have been heard of the March 28 National Assembly election in Anambra State as Igbo socio-political group, Ndigbo Unity Forum has described the election as free, fair and credible even as lawyers have notified the Senator elect of their readiness to give her free legal services. The President of Ndigbo Unity Forum, Chief Augustine Chukwudum described the election that produced Mrs. Uche Ekwunife as Senator elect for Anambra central senatorial zone as the freest of all elections ever conducted since Nigeria’s return to democracy. The Chief Justice of Nigeria, ‎CJN, Justice Mahmud Mohammed, Wednesday, said he was worried about the rising number of “fake” lawyers in the country. ‎The CJN who stated this during the official launch of “Stamp for Lawyers”, ‎which was produced by the Nigerian Bar Association, NBA, bemoaned that the prevalence of fake lawyers negatively affects the integrity of the legal profession and casts a shadow of disrepute on the judiciary as an arm of government in the country. He insisted that one of the major challenges facing Judges today, “is how to differentiate between a “real” and “fake” legal practitioner”. President-elect Muhammadu Buhari on Tuesday said he would end fuel subsidies and the oil and gas sector would be reformed as a matter of priority in order to attract new investments. Unveiling his economic policies at a Lagos Business School breakfast meeting, he added that he would run a very lean government, which would involve rationalising overlapping and redundant ministries, departments and agencies (MDAs) in line with the Steve Oronsaye presidential committee report. As the Easter tide ushers us unto a new plane of life, I deem it auspicious to write you at this time on the stalled inauguration of Most Rev Peter Okpaleke as the Bishop of Ahiara Catholic Diocese. I am directing my contribution on this subject to you rather than the laity of the diocese because I consider the body of priests the principal opponents of the Bishop’s appointment. While some sections of the laity leadership have at one point or the other also expressed strong reservations on the appointment, the fact remains that by virtue of their ministerial office and public esteem, the overwhelming majority of Catholics defer to priests. Though a misnomer, the local expression, uka fada, stemmed from the perceived considerable power and responsibility of the priesthood. Bearing this in mind, it would be unhelpful to the resolution of the Ahiara bishopric question to continue to give the impression that the ‘activist’ priests involved in the matter are only giving vent to the resolution of the laity. You, our beloved priests, are central to restoration of the Church’s truncated mission in Ahiara Diocese. 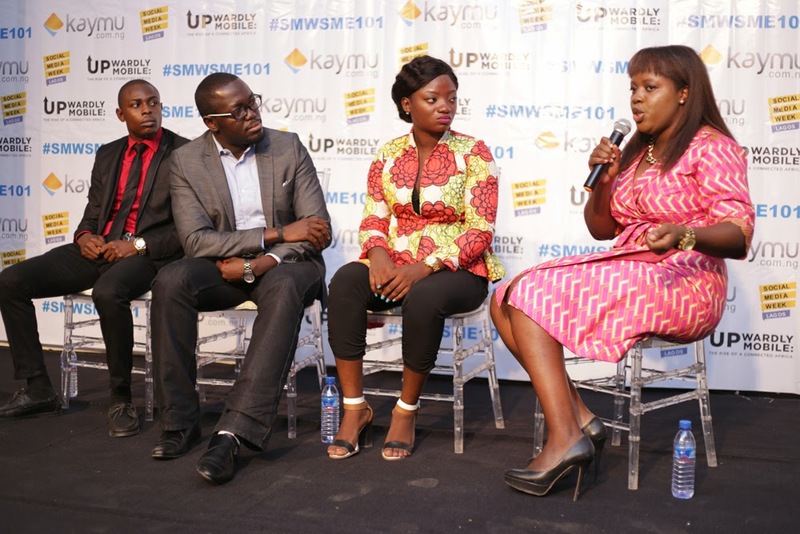 As part of activities to mark the 5th edition of the most progressive and interactive mobile focused event in Sub-Saharan Africa, Mobile West Africa Conference, the MD of Kaymu Nigeria, Evangeline Wiles will join other panellist to discuss the future of the mobile industry in Africa on the 22nd of April,2015. Petroleum Minister, Mrs. Diezani Alison-Madueke, said Tuesday night, she was not seeking asylum in any part of the world, as claimed by her traducers. Madueke, who spoke through the Group Public Affairs General Manager of the Nigerian National Petroleum Corporation, Mr. Ohi Alegbe, denied ever contemplating relocating from Nigeria. An online publication reported Tuesday that the minister had been denied asylum by six countries where she had so far applied but did not mention the countries involved. Earlier this evening Sahara Reporters published a blockbuster report they got from Business Council for Africa (BCA) claiming that Petroleum Minister, Mrs Diezani Alison-Madueke, has been denied asylum by six countries where she had so far applied. The report claims she's looking for a country to run to before Gen. Buhari takes over as president because she's scared she might be probed or jailed. It observed that despite an earlier promise, it is now understood that Buhari’s anti-corruption fishing net will include Ministers currently serving under President Goodluck Jonathan. Alison-Madueke’s departure from Nigeria is likely to be followed by several other PDP elders, party members and supporters as well as some former Government officials, as Buhari's anti-corruption drive will be far-reaching. While BCA agreed that the March/April 2015 were “the most credible elections in Nigeria's history”, it said they could not be called the most incorruptible. On the contrary, it referred to them as the worst because of the amount of money that the PDP so freely and openly spent on trying to secure the re-election of Mr. Jonathan. “The stories and reports from throughout the 36 States of the amount of money distributed by the PDP to elders, rulers, church leaders, unions and youth leaders amongst others in an endeavour to favour the voters towards the PDP has backfired badly,” the report said. BCA said that if the 2011 elections were considered bad, the 2015 elections will undoubtedly go down as the most corrupt in Nigeria's history, certainly since 1999, as the amount of money being distributed as bribes primarily by the PDP so very openly would readily confirm. It reported that since November when campaigning began, President Jonathan and General Buhari during their travels made no fewer than 109 promises of what they intend to achieve if given the mandate in the presidential election.